The second day of the last segment of the fashion season showcased Paris Fashion Week favorites including an array of gender and social neutralizing looks from designers Alexis Mabille, Dries Van Noten, Rochas and Mugler. Alexis Mabille offered a solution to a country girl in the city with ready-to-wear pieces that were urban, cow-girl chic. The spring looks were simple and charming with a sense of playful youth about them, including a variety of Dorothy ensembles that resembled more Meatpacking District than Kansas. 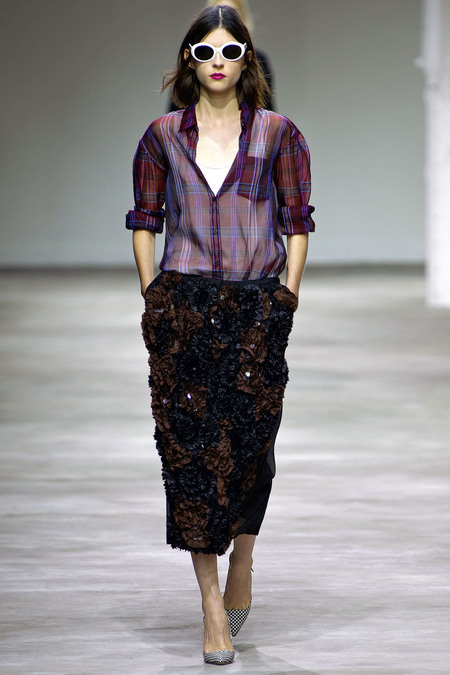 Dries Van Noten showed seductively grungy looks reminiscent of ’90s icons like Courtney Love. Focusing on the fashionable functionality of plaid, Van Noten took masculine prints and transformed them into their more feminine crepe, taffeta and organza counterparts. Enchantingly quirky and whimsical, Rochas presented a line of clothing that accentuated the idea of playfulness. Rochas incorporated cropped tops, amorphous, box dresses and oversized silk visors into a drove of feminine creativity. Focusing mass appeal on the trendiness of leathers, Mugler featured a beautifully crafted variety of calf-skin skirts and blouses, each more structured than the next. The fabrics were gathered and cut with simple sensuality and grace, catering to a soft sculptural appearance.